Obvious questions are the devil. They’re a bankable way for a writer to come across as poorly informed or lacking imagination and a creeping rot capable of quickly undoing an interview from the inside out. But this one isn’t going to go away: How many times has Barry Johnson been asked what he thinks about Kanye West in the last two months? Back at the start of August, the California pop-punk band - completed by guitarist Chase Knobbe, bassist Matt Ebert and drummer Jeff Enzor - released Fake ID, the first single from their fourth LP, ‘Cody’. A whistle-stop tour through punchy guitar hooks, an addictive chorus and bittersweet lyrics, it immediately marked a slight change in focus for a band who’d always prized their sharp edges as much as their ability to write a pop song. And, right there at its heart, was a lyric that Johnson became convinced would sink the song, maybe even the whole record, for good. “What do you think about Kanye West?” he sings, sketching out a conversation between two people at a party. “I think that he's great, I think he's the best. Yeah, I think he's better than John Steinbeck and I think he's better than Phil Hartman. Don't you agree? Can’t you see you’re just like me?" "The Kanye West lyric was putting myself out there to really be judged. Are people going to get this?" Kanye West is a red flag for a number of reasons. A throwaway allusion is easy to dismiss as glib or zeitgeisty and is also liable to dredge a few rockist bores from their caves in order to lament the death of guitar music (again). But Joyce Manor don’t tend to indulge idle references. As much as the melody and accompanying words fell out of Johnson’s head wrapped in a bow, the song, and this exchange in particular, exemplifies the conversational nature of his writing. Joyce Manor’s lyrics have long been eminently quotable because they echo the beats of our own interactions. As a result, there are a few delicate balances being maintained on ‘Cody’. These songs take Joyce Manor into uncharted personal waters regularly, just as they offer the same wry observations and eminently singable hooks that have kept people coming back. Equally, Johnson's manner has never been so frank and forthright, but the band have never been so musically long-winded. 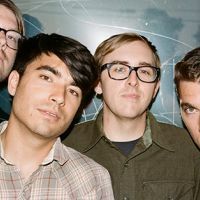 They were recently awarded the “modern-day gold standard for jamming econo” by Andrew Unterberger in a Spin profile, but ‘Cody’ gets very Stretch Armstrong (for Joyce Manor, at least) with its track times. Stairs, its ninth song, is over four minutes long. That’s around a third of the length of their second album, ‘Of All Things I Will Soon Grow Tired’. Behind the boards for ‘Cody’ was Rob Schnapf, producer of multiple Elliott Smith records, Saves The Day at their most clean and presentable and Guided By Voices’ ‘Isolation Drills’, where the rendering of Robert Pollard’s writing perhaps most resembles muscular, classic power-pop. Prior to signing up, Johnson sent Kevin Devine, who worked with Schnapf most recently on 2013’s ‘Bulldozer’, a Twitter message asking what the experience was like and received rave reviews in response. Schnapf has a rep as a studio and songwriting theorist, so Joyce Manor embraced his knowledge and the fact that, for the first time, they would be able to do pre-production on an LP. There are multiple instances on the finished collection when things happen at precisely the right time. Pop songs are a complex undertaking and ‘Cody’ wears its smarts with pride. From Last You Heard of Me’s slow build to Reversing Machine’s perfect chorus drop, the work in each song’s construction is immediately apparent. It’s like Joyce Manor have uncovered fresh blueprints that open up new possibilities for the raw materials at their disposal. "All our records have been pretty harsh and in-your-face loud. I really wanted to push myself to do something that was musically more beautiful." “We sat in a rehearsal room with Rob and he was like: ‘Try it like this, try it like that. Let’s lose this part and put it at the end of the song,’” Johnson says. “With Reversing Machine he was like: ‘That one’s good how it is.’ That was the rare exception. With every other song there was some adjustment made to have the song reach its full potential. A striking addition to the band’s palette are the record’s harmonies. Nate Ruess, of Fun., provides soaring support on perhaps its most beautiful song, Angel In The Snow, and helps Johnson’s isolated, longing words perform the classic pop illusion of lifting and dampening spirits all at once. “How come nothing amazes me?” he sings. “I don’t know.” Again, a cocktail of Schnapf’s input and more time in which to work are to thank for their introduction. The latter is something that simply wasn’t available to them for their last release, the rough diamond ‘Never Hungover Again’. “I would have wanted more harmonies on ‘Never Hungover Again’,” Johnson says. “No-one really knew how to do ‘em. I think [producer] Joe Reinhardt did but we didn’t have the time. We barely had enough time to finish basic tracking. You need to try a lot of things. It’s a lot of trial and error when it comes to that kind of stuff. 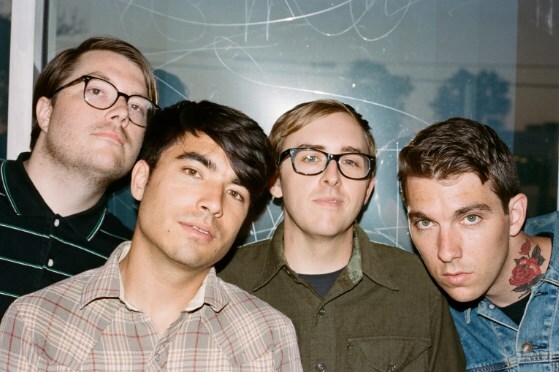 By forging ahead with these alterations, Joyce Manor are also drawing attention to their development as songwriters. Their scrappy beginnings, on the thrilling self-titled record that announced them, are less of a songwriting touchstone than they have ever been. With three quarters of the band staring down the barrel of their 30s, though, looking over their shoulder isn’t something they’re able to avoid altogether. Eighteen, one of a number of songs to deal with internal rather than external dialogue, ends on a particularly piercing line: “I feel so old today.” But Johnson will only reminisce at arm’s length. The assertion that a person is interested in moving forward at all times is trite and easy to dismiss precisely because it’s a statement that most fail to see through. ‘Cody’ is founded on the principle, which is bold given the high regard Joyce Manor’s back catalogue is held in. “It’s the first record I ever wrote about being old,” Johnson concedes. “It’s really easy to romanticise when we used to tour in a minivan and we were really hungry for success. You just want it so bad when no-one cares about your band, but you think you have good songs and want to win people over. I’m a little nostalgic for those times but I try not to dwell on it too much. I try to push forward and do the best at what’s going on now instead of romanticising the past. I have to do work at that because the temptation is always there, especially for me. "I don’t want to do a 'return to form' record. I want to keep pushing into whatever it is we’re pushing into." The band’s rapidly expanding fanbase seems to get that. Joyce Manor are one of a number of punk groups whose admirers seem to have left some of the genre’s more tribal and reductive habits behind. As the band have stepped from tiny rooms to decent support slots and handy headline shows of their own their fans have gone with them. It helps that they - like Modern Baseball, who have set up a tour hotline to ensure people feel safe at their shows, or PWR BTTM, whose rider for recent tours includes a request that there are gender neutral bathrooms at venues - are invested in ensuring that people at their shows feel like they’re part of something. Their stand against stage diving a couple of years back ignited a debate on safe spaces and set spittle flying from a bunch of comment section tru punx, but they stuck it out. They have their fans’ backs, but Johnson is learning that this is something that works both ways. Their growth is cool with the kids at the front. “I don’t know what’s up with that,” Johnson says. “When we put out Fake ID I was like: ‘People are going to hate this. They’re going to hate the Kanye West lyric, they’re going to hate the harmonies. They’re going to hate how the song’s in C, it’s major scale, it’s very upbeat…’ None of these things are trademark Joyce Manor things to do and could be really alienating to people. The kids, it seems, are alright. It's early days, but ‘Cody’ has the ring of a record that will stay by their side for some time. Maybe until they feel old, too. ‘Cody’ is out on October 7 through Epitaph. Joyce Manor have announced a spring UK tour. Joyce Manor have shared a third single from their new LP. Joyce Manor have released a new video.